Today I released the Poetry and Photo Travel Guide: Italy. It includes 16 poems and 40 photographs not counting the cover and author picture. It is available on Amazon in both paperback and Kindle versions. Description: This collection of original poems and photographs describes many desirable tourist sights in Italy, including Venice, Verona, Florence, Pompeii, the Amalfi Coast, and Rome among others. The paperback version is on sale for $9.49. The Kindle version costs only $3.99. Coming soon: the young adult epic fantasy Discordant Tones. The formatting is being finalized, and then the cover artwork will be the last part necessary before publication. I attended MystiCon in Roanoke, VA about a month ago, and now that I have some time, I thought I would write about the experience. MystiCon is an annual science fiction, horror, and fantasy convention. The author guest of honor this year was Orson Scott Card. There were over a hundred guests, and the attendee passes sold out. I had a great time and met some wonderful people. The panels I was on and a brief description of what was talked about in each follows. This was my first panel, and it was held at midnight. I was unsure of what to expect, but the other guests on the panel helped me feel at ease. We discussed the meaning of “Rated R” in today’s culture, comparing film and books, and we decided that individual maturity, rather than age, dictates what a person can handle on the screen or on the page. As the only author of young adult literature on the panel, a number of questions were directed to me regarding how authors of young adult fiction decide what is appropriate in their writings. We agreed that in both writing and film it is important to understand the desired audience and to know what they want and can handle. The objective of this panel was to discuss “The Hobbit” movie. The panel contained a number of dedicated Tolkien fans who could find little at fault with the movie since it displays a world they love on the screen for them to enjoy. Since I have not read all the works that Tolkien wrote, I felt less prepared to discuss every minute detail than the other panelists. However, we did agree that there were some issues with timing and over the top action sequences. 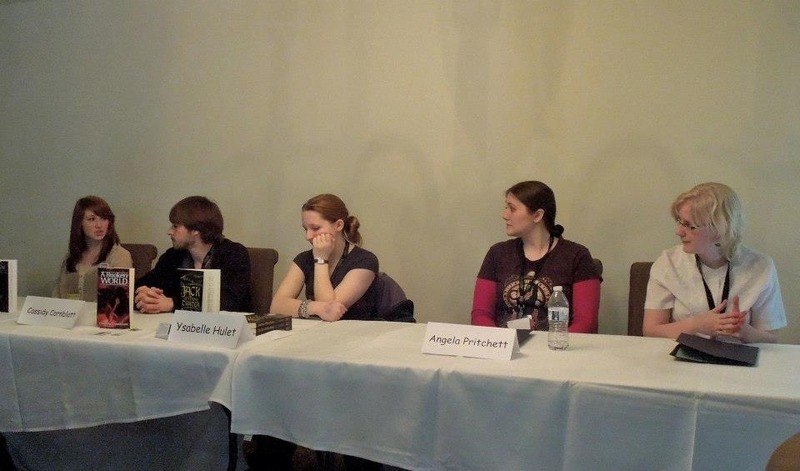 This was a panel of young adult authors and the scholarship winner. The two other authors on the panel were both sophomores in high school. We discussed how we were published and what we hope to do in the future. We also talked about the writing and editing processes. – Young Adults – What Are They Really Thinking? This panel consisted of the same panelists as the previous one but with a different moderator. Here we discussed our daily lives, how we fit writing into our schedules, and what our friends and family think of our writing. From left to right: JM Lee (author), Cassidy Cornblatt (author), Ysabelle Hulet (author), Angela Pritchett (moderator), Maura Lydon (scholarship winner). Photo credit to J. Thomas Ross. Since I finished up my goals for the break, I had some spare time and wrote the following. This is a poem consisting of rhyming couplets of iambic pentameter. Enjoy! One morning I beheld a scary sight. While passing through the woods, I saw a light. Across the glade there was a brilliant spark. And fast beneath the underbrush it fled. The fear held me in place like boots of lead. The form of that strange creature passing me. But winged I thought it was and many limbed. Before it disappeared, I heard it shriek. The sound rose steadily and hit a peak. The incident this moment reached its end. I traveled quickly forth around the bend. On which my foot did tread without a thought. A hole in ice that covered up a creek. I landed in cold water with a squeak. And then I saw the creature on the land. Now clearly in my sight the creature stood. I stared in fright and froze as still I could. Or maybe dragon small and not a rat. And briefly I thought that I’d soon be dead. While I stood still, it slowly came to me. As it drew closer, I tried not to flee. Before I knew it, it was at my side. My jaw was clenched shut as my arm it eyed. And where it touched my skin, it left a mark. And my opinion’s that it’s rather fine. Why do your characters act the way they do? What made your villain so evil? This is the psychology of writing. Psychology is the study of the mind, and it can be referenced to develop rationales for why people behave in a certain way. Although this is typically thought of as a field used only in the real world, it can also be important in literature because it delves into the background of the characters. As a reader, looking into the psychology of writing can help to illuminate the reasons behind the way the characters are portrayed. It helps explain how they get to the point they are at in the story, and it can show why certain characters connect better than others. In some cases, it can even demonstrate why these characters are in the story at all. As a writer, the psychology of writing is extremely important. Even if a writer chooses not to include this aspect of the story in his actual writing, thinking about the psychology allows the writer to get a much better feel for the characters. The writer should understand why the characters behave in the manner they do. Even if certain behaviors may seem strange to the readers, the writer must know why and how these behaviors come about. There is almost always an explanation, and contemplating this rationale can lead to new insights about the characters. I specify fiction writing rather than all writing because in fiction, the psychology can be explored in a very real sense. The fiction writer determines everything about his characters, so when he wants to examine his characters from their foundations up through their actions, he can do that without fear of making incorrect inferences. Psychology is just as important in real life, especially since this is the context in which the field is typically referenced, but a nonfiction writer has to be more careful when using it. Nonfiction deals with real people, so messing around with psychology can easily become very controversial if judgments are made that slander someone’s image. Fiction writers do not have to worry as much about this because the characters are largely their own creation. Thanks go to Jessica Paige from the blog J P Marshman for nominating me for the Inspiring Blogger Award! Check out her blog for some great posts. 1. My favorite time to write is around midnight when most people are asleep. This minimizes potential distractions. 2. I prefer to drive manual rather than automatic because it makes driving more interesting. 3. One of my favorite foods is a toasted twist bagel and cream cheese. A twist bagel is a combination of pumpernickel and rye with poppy and sesame seeds. It’s actually not technically a bagel, but it’s similar and made at a bagel shop. 4. I eat a bowl of cereal at least once a day, and I only use whole milk. 5. I enjoy listening to upbeat Spanish pop music, especially when I’m doing work or studying. At college it helps to drown out noises when I want to focus. 6. I like watching comedies, such as How I Met Your Mother and The Big Bang Theory. I also like British comedies, such as A Bit of Fry & Laurie and Blackadder. 7. I take a very long time to write things. I actually write and type rather quickly, but I spend a lot of time thinking about what I am going to say and then rereading it to make sure it sounds decent. Since it is December 21, 2012 and the world has not yet ended, I have decided to write a post about doom myths. It seems that one pops up every couple of years, proclaiming that the world as we know it is coming to an end and everyone is going to die. Why are these myths so prevalent in today’s culture? The answer has to do with humanity’s obsession with vitality. Almost everyone is afraid of dying because it is the great unknown. We cannot fully comprehend death, whether we believe in an afterlife or not, and this causes us to be intrigued by it. When a rumor about the end of the world begins to circulate, people latch onto it because they are naturally curious, and whether they believe the rumor or not, a slight anxiety lurks at the back of their minds. It is also passed along out of sheer boredom. A doom myth can be an interesting spark in an otherwise humdrum existence. Literature often deals with end of the world situations as well, except in these cases the threat can be quite real. In dystopian works, the end typically has already come and gone. Our fascination with these stories stems from the same source as our fascination with doom myths. We want to read about others’ thoughts regarding these types of situations since we really do not know what would happen. The question in the minds of many is not will the world come to an end, but when, how, and most of all why. I was recently let out of college for winter break, so now that I have some time, I figured I would update my blog. I have several things I hope to accomplish over the break and a couple events coming up, so I am posting them here for anyone interested. 2. Write up a research proposal for next semester regarding cognition. 3. Post periodically to my blog. 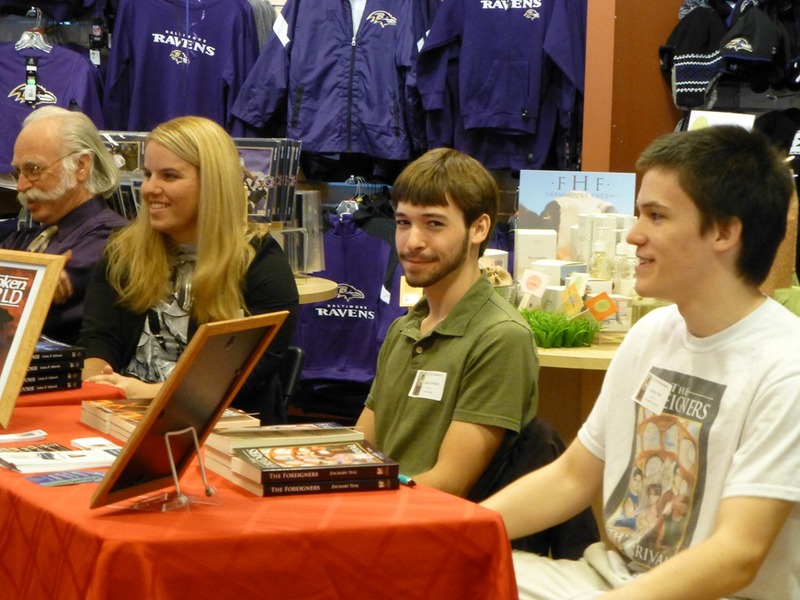 I recently participated in a book signing at Greetings & Readings in Hunt Valley, Maryland. I had a great time meeting fellow authors and interacting with the public. Thanks to everyone who came out!